Don't be blue that the holiday season is over! Branch out to 7PM Boutique, WireQueen Jewelry, Life is the Bubbles, oBo Creations and Beadmask for wonderful winter jewelry instead. 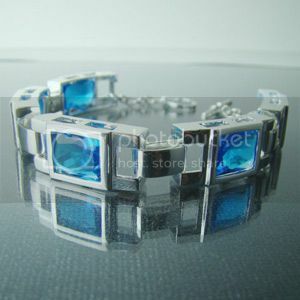 7PM Boutique's blue topaz bracelet is a cool accessory, especially for those winter babies born in December. The birthstone is known for its soothing properties - it'd be great to wear to a work presentation or a first date that has butterflies bumbling around in your stomach. The blue stone is encased in 925 sterling silver links that measure 25.82 x 12.76 x 7.36 mm. Entire bracelet measures 8 inches and closes with a toggle clasp. 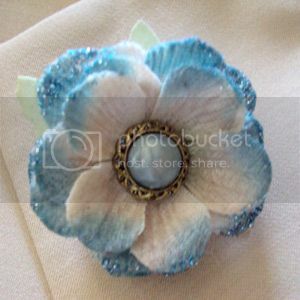 Wirequeen Jewelry's blue flower brooch will add a touch of soft to a business woman's sharp tailored suit. Or if you're not required to wear professional work clothes at your job, use it to embellish your winter jacket like I do! The white flower is trimmed with blue and glitter. A pearly center surrounded by a decorative golden circle adds a vintage elegance to the flower pin. The fashion brooch measures 1 7/8 inches. 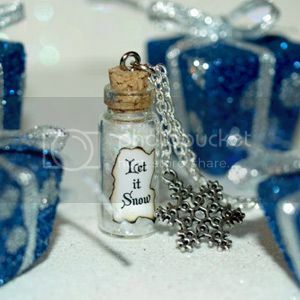 Life is the Bubbles' Let It Snow necklace is a wondrous way to wish for a winter wonderland. The weather being this cold in Delaware without a flurry in sight saddens me. But this enchanting bottle of shimmery snow invokes memories of the world covered in white magic! The written proclamation is emphasized with a silver snowflake charm. The silver chain drifts 19.5 inches long and closes with a heart toggle clasp. oBo Creations' grey blue resin pendant reminds me of a frost dragon! The unique pattern of pale blue grey accented with gold is created with her dragon skin signature hand painting technique. The way she mixes the colors is unpredictable, so each piece is truly one of a kind. The oval bezel is crafted from brass and plated in high quality antique silver. 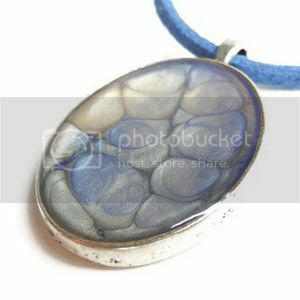 The pendant comes with buyer's choice of matching chain or navy blue suede cord. 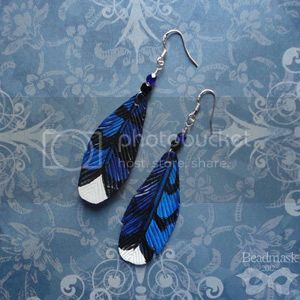 Beadmask's blue jay feather earrings are handcrafted from leather and wrapped with sterling silver wire. They are swingy dangles, measuring about 3 inches total, or 2.75 inches from the earlobe. The pretty pair is part of an open ended series, so the exact pair photographed may not fly your way. Because each earring is handpainted, they are not identical - but all are made in the same style and quality. These would make a one of a kind gift for a bird watcher. Such pretty jewelry in my favorite color!